Empanadas are individual Spanish turnovers most often filled with meat and vegetables. This fried empanada recipe, called empanadas fritas de queso, is filled only with melted cheese, and as empanadas go, they are quick and easy to make. Despite their simplicity, they are sure to become a family favorite. Whole milk mozzarella cheese melts beautifully, but feel free to experiment with the filling. Some people like to add a little chopped onion or use a variety of cheeses. 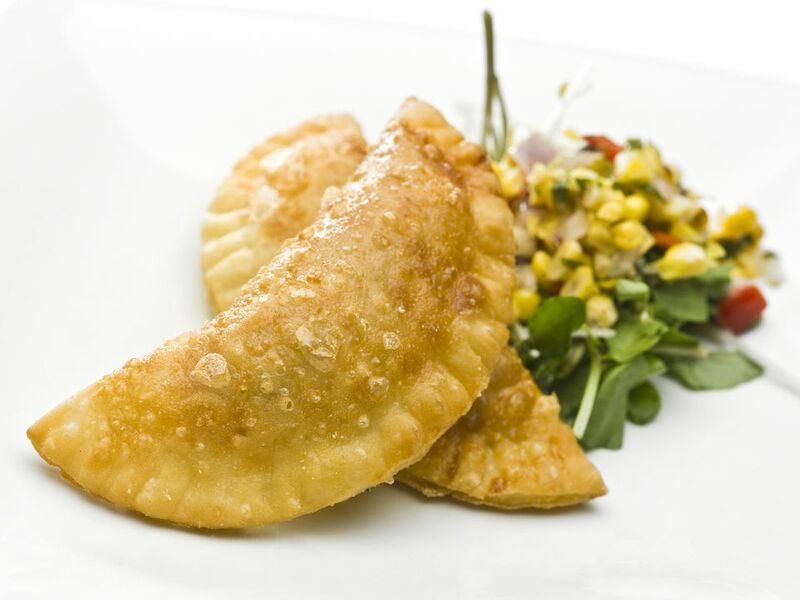 While these empanadas are fried, you can also bake them with good results. In a large bowl, whisk together the flour, salt, baking powder, baking soda, and sugar. Gently mix the vegetable shortening into the flour. Place the milk and water in a saucepan and heat until almost boiling. Stir the hot liquid into the flour mixture. Add more water (1 tablespoon at a time) if the mixture seems too dry and crumbly, or add more flour if the mixture is too wet and sticky. Knead dough gently until well mixed and homogenous. Divide dough into 16 portions, and roll each piece into a ball. Let the dough rest for 5 minutes. Grate or finely chop cheese. Roll each ball of dough into a 6- to 7-inch circle. Place 1 ounce of cheese in the center of each dough circle. Fold the dough in half over the cheese to form a semicircle. Press down firmly along edges to seal. Roll the edge inward over itself and press down again to seal. Crimp edge decoratively with a fork, pressing to seal. In a deep-sided skillet, pot, or deep-fat fryer, heat several inches of vegetable oil to 350 F. Fry empanadas in batches, turning at least once, until golden brown. Drain empanadas on paper towels. Empanadas can be kept warm in a 200 F oven for up to 1 hour before serving. Serve warm. Preheat the oven to 400 F and place the empanadas on a baking sheet. Bake for 20 to 25 minutes until they are golden brown. To get a shiny, crispy crust, brush the empanadas with a mixture of 1 egg yolk and 2 tablespoons of milk (or 1 tablespoon water) before baking.